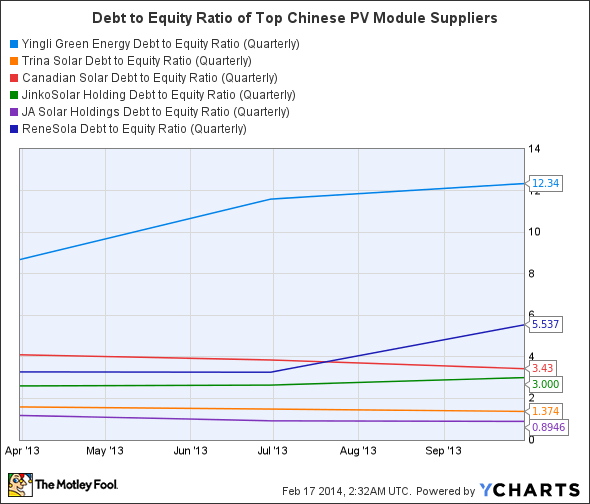 Has Yingli Green Energy's rise come at too great of a cost? With so many companies competing for market share in the solar industry, it can be difficult to identify which ones will be able to persevere and succeed. One of the companies at the front of the pack is Yingli Green Energy (NYSE:YGE), a global leader in photovoltaic module, or PV, manufacturing in terms of production capacity and shipments. With the release of its third quarter earnings, Yingli showed that it had plenty to be excited about. Revenue climbed 8% quarter over quarter and 63% year over year, while gross margin improved from 11.8% in to 13.7% quarter over quarter. There's more to the story than just that, though. So, while we wait for the release of the fourth quarter earnings report, let's examine some other aspects of the company. According to NPD Solarbuzz, Yingli hit the top of the charts for 2013 in two separate categories: in-house cell production and PV module shipments. Yingli doesn't quite have the luxury of resting on its laurels for too long, though. Recognizing the value that resides in in-house cell production, Trina Solar (NYSE:TSL) announced this week that it has acquired a majority stake in Shenzhen S.C.'s wholly owned subsidiary, Hubei Hongyuan PV Science and Technology. Hubei Hongyuan expects to achieve a production capacity of 420 MW by the middle of the year. This will substantially supplement the 2,400 MW of annualized cell production thatTrina recorded for 2013. According to NPD Solarbuzz, the company ranked No. 3 for 2013 in in-house cell production. Like Yingli, Trina's gross margins improved over the same period, from 11.6% to 15.2% in the third quarter. The deal with Hubei Hongyuan may improve those margins further. Yingli is not limiting itself to traditional PV projects. The company is working on the development of the world's largest hydropower and PV hybrid project, which is being constructed in Qinghai Province, China. Having begun grid connection and commissioning, the hybrid project has a total capacity of 320 MW, of which Yingli has supplied 15 MW of PV modules. An unusual deal was also struck with state-owned China National Nuclear Corp. and its subsidiary, China Rich Energy. The joint venture will develop 500 MW of distributed generation solar projects across China. Mr. Hongchao Xu, Chairman of the joint venture and Deputy General Manager of China Rich Energy, said, "While CNNC remains committed to nuclear power development, we are increasing our activities in the renewable energy space, in order to expand our development space." The hybrid PV-hydropower project and the deal with China National Nuclear Corp. demonstrate Yingli's ability to adeptly pursue non-traditional projects -- both utility-scale and distributed generation -- and gain greater market share in China. This is increasingly important for the company as it tries to geographically diversify, relying less on Europe. With so many things going well for the company, it's all too easy to miss some of Yingli's weaknesses. And, as far as weaknesses go, one of the most troubling is the company's debt -- Yingli sports a dizzyingly high debt-to-equity ratio of 12.34, which is significantly higher than its peers. 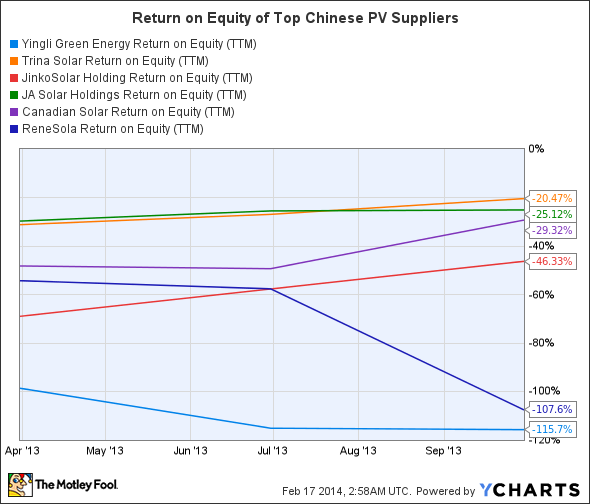 Another area of concern for Yingli is its return on equity, which is the lowest among its peers. This is another sobering reminder that just because the company is leading the pack when it comes to PV module shipments and in-house cell production, it doesn't mean that shareholders are benefiting. Well, for Yingli, it may just be that its PV module shipments and in-house cell production achievements have come at too great of a cost. For the third quarter, Yingli's Diluted EPS came in at ($0.25). Earning the No. 1 ranking isn't what shareholders are most concerned with after all. Look at three of the other companies on the top ten list: Canadian Solar (NASDAQ:CSIQ), Jinko Solar (NYSE:JKS), and Trina. Like Yingli, their return on equity and debt-to-equity ratios are also cause for concern; however, unlike Yingli, they are profitable. Third quarter diluted EPS for these three companies came in at a respective $0.50, $0.71, and $0.15. There's plenty to be excited about when it comes to Yingli Green Energy, but, as always, one must look at the bigger picture. Surely, Canadian Solar, Jinko, and Trina investors are happier with their companies' profits than they are disappointed at ranking below Yingli in PV module shipments and in-house cell production. Regardless, fourth quarter earnings reports are right around the corner, and their releases will, undoubtedly, shed some light on the ever-changing solar sector landscape.